On 21 September 2018, Invalesco sponsored the Yorkshire Ladies’ Lunch at Oulton Hall in aid of Variety, the Children’s Charity. What is Variety all about? Variety, the Children’s Charity was inaugurated in the UK in 1949 when it was then known as ‘The Variety Club of Great Britain’. It is a charity which was founded especially for children and young people with the aim of helping less fortunate children reach their potential. All donations given to Variety are used to improve the lives of sick, disabled or disadvantaged children. This is done by gifts of practical help or by creating childhood experiences that will remain with the children involved for life. Although recognised for their high profile events, Variety retains a core value usually more attributable to smaller charities. Any monies raised in Yorkshire are spent by Variety in Yorkshire. 2018 marked the fifth anniversary of the Ladies’ Lunch. There are many famous people who generously gift their time and efforts to support Variety. This includes Sir Michael Caine and Dame Judi Dench. On this occasion, the Lunch was attended by the celebrity chef, Rosemary Shrager who treated guests to a candid account of her career and the world of celebrity. Rosemary is best known for being the haute cuisine teacher on the ITV reality-based series ‘Ladette to Lady’ and for having made an appearance on the ITV show ‘I’m A Celebrity…Get Me Out Of Here!’. The event allowed those attending the chance to catch up with friends or meet new people. 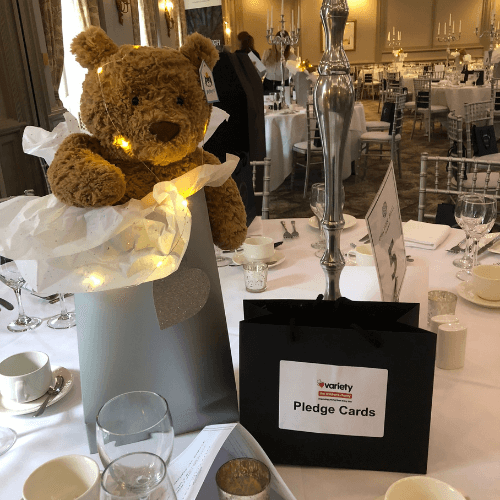 Monies were raised not only through ticket sales and pledges made by those attending but also by the popular naming of teddy bears which were then gifted by the charity to children. A fantastic afternoon was had by all and, more importantly, the not insignificant sum of over £20,000 was raised for the charity. This was an amazing effort for a very worthy cause and one which Invalesco is proud to support.